Choice of 4mm or 3mm steel stock, sheath style and handle material. This knife is ideal for bushcraft and woodcraft needs. The 4 inch blade is very versatile as you have the length for large carving and cutting tasks as well as fine carving. The Woodlander is the most popular model for this very reason. The 4mm blade model is the thickest we offer, really solid and suited for more rigorous work. Great for splitting when you want the security of no blade flex and you are going to be really working hard out in the woods. The 3mm blade model is slightly lighter and more suited for everyday woodcraft and carving. It is still strong and a great bushcraft knife but is better suited to carving and food preparation. It has a contoured handle for good positive grip and is comfortable both in normal use and inverted when holding in different carving grasps. As used by the instructors at Woodsmoke and other specialist bushcraft schools. We make these knives with various handle materials and sheath styles. 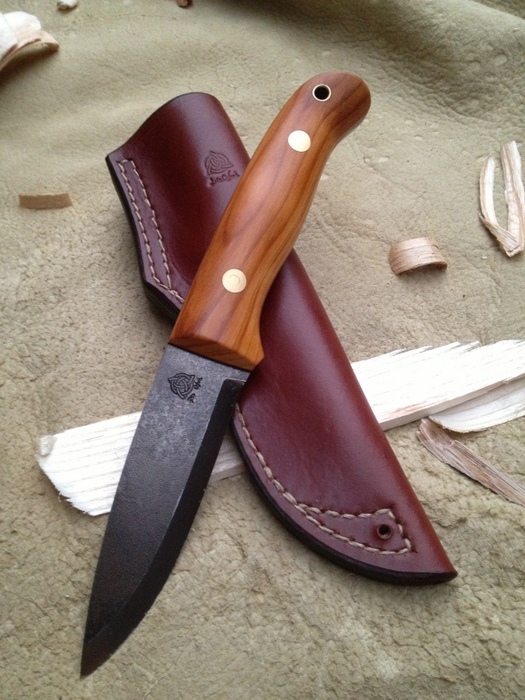 The ‘Woodlander’ price includes the standard belt sheath.